Sometimes I wonder if there is no more perfect breakfast treat than the muffin. Sure, cinnamon rolls are sinfully amazing and lord knows, I’ll never ever give up my bagels but they both seem to take forever to make, even if most of the prep is done the night before. But muffins? Who can refuse making a freshly baked breakfast treat in under 30 minutes? 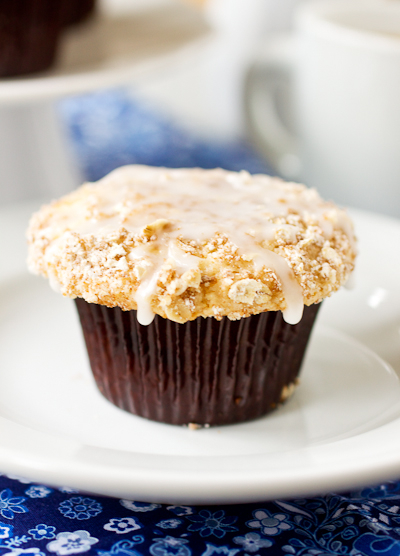 These coffeecake muffins combine the best of two breakfast worlds – cake (always perfect for breakfast) and muffins with a streusel topping – and as a bonus, you’ll make them in the food processor! The sour cream in the batter is the key to keeping the muffins moist, the dark brown sugar deepens the effect the crunchy streusel has on top, and part of the streusel is actually mixed right into the muffin batter. Does it get any better than that?? They are seriously addictive and because this recipe only makes a dozen muffins, you may want to consider doubling it if you’re expecting company or bringing them to work. These babies will go fast! If you’re not against using pecans, substitute 1/2 cup for the oats; I used oats here because of Kyle’s nut allergy. Also, if you don’t have a food processor, chop the oats or nuts and mix the batter by hand in a large bowl. To make the muffins: Adjust an oven rack to the middle position. Preheat the oven to 350 degrees F. Line a 12 cup muffin pan with paper muffin liners. In a 1 cup liquid measuring cup, measure the sour cream then whisk in the egg and vanilla; set aside. In the bowl of a food processor fitted with the steel blade, add the oats, brown sugar, and cinnamon. Process in quick pulses (about 10-12) until the oats have broken up some; transfer the mixture to a bowl. Return the bowl and blade to the processor and combine the flour, granulated sugar, salt in the bowl with quick pulses. Add the butter over the flour mixture and pulse until the butter is oat-sized, about five 1-second pulses. Carefully remove 1 cup of this mixture from the bowl (try not to remove the bowl from the processor) and stir it into the oat mixture until a lumpy streusel forms. Add the baking powder and baking soda to the food processor bowl and pulse them into the flour mixture. Add the sour cream mixture to the bowl and process until the flour is just moistened. Add in 3/4 cup of the streusel and pulse until the it is distributed throughout the batter with five 1-second pulses. Divide the batter evenly between the muffin cups then sprinkle the remaining streusel evenly over the batter, lightly pressing it down into the batter to ensure it will stick while baking. Bake for 18-20 minutes, rotating the pan halfway through the time – just a few crumbs should stick to a toothpick when tested in the center of a muffin. Let the pan cool on a wire rack for 5 minutes then transfer the muffins to the rack. Set a piece of parchment or wax paper under the rack. To make the icing: In a small bowl, whisk the confectioners’ sugar and water together until the sugar is smooth. Drizzle 2 tsp of the icing over each of the muffins. Serve warm or at room temperature. Add the baking powder and baking soda to the food processor bowl and pulse them into the flour mixture. Add the sour cream mixture to the bowl and process until the flour is just moistened. Add in ¾ cup of the streusel and pulse until the it is distributed throughout the batter with five 1-second pulses. To make the icing: In a small bowl, whisk the confectioners’ sugar and water together until the sugar is smooth. Drizzle 2 teaspoons of the icing over each of the muffins. Serve warm or at room temperature. Looks great! And you’re right – you can’t beat this wonderful breakfast treat that can be made in under 30 minutes! YUM! I’m totally making these for my next breakfast meeting at work! You’ve combined 2 of my favorite breakfast treats! Muffins and coffee cake!!! They are beautiful and I bet they smelled amaaaazing! Mmm…I can almost smell how good these are! These look divine! 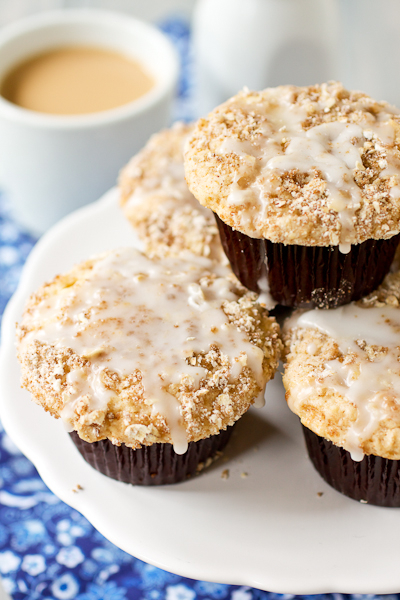 I love the idea of coffee cake in muffin form. Oh my word these look amazing. Much better than the toast I had for breakfast this morning! I just finished a Starbuck’s muffin while I sit here working… and now I’m terribly unsatisfied 🙂 These look great! These look scrumptious and the ingredients consist of ALL the flavors I love in a moist and tasty muffin. I like your previous recipe’s flavors, too! these look beautiful. i’m sure they taste even better! !